A recurve bow is a tool that you need to use in order to hit your mark. Choosing your first recurve bow can sometimes be frustrating because there are so many different features and there are various kinds of bows that are available to you on the market. Having a bow that is customized to your body frame and skill is important because if you use a bow that you can't handle, then you won’t be able to shoot it without getting injured. You would also risk your chances of enjoying the sport and being able to use the bow correctly. To help you decide, we’ve chosen to review one recurve bow that is guaranteed to satisfy your needs whether you’re a beginner or not. This bow is excellent for anyone who is expecting to use it for hunting or who is into a great looking bow. This recurve bow is manufactured by a company that has a wide selection of archery accessories and equipment. It is available in two orientations, which are left or right. Comes with an instruction manual and a 100% satisfaction guarantee! The KESHES Takedown Recurve Bow has an ergonomically designed handle to prevent slippage from your hands when shooting. It is rounded out and has a beautiful wooden finish which not only looks good but also gives you a comfortable grip while you’re aiming at your target. As such, you’ll be able to pull hard on the drawback and get more force behind the pulls, which can help you shoot accurately and release the arrow at a fast speed. The recurve bow has a round edge riser and features wooden limbs which are layered with black fiberglass on the outside. It also has several screws which are attached to the limbs. This bow is designed to be used for hunting adventures and archery tournaments. Unfortunately, although this bow is durable, its full wooden design requires more maintenance as compared to those made of aluminum and other materials. The KESHES Takedown Recurve Bow has pre-installed brass bushings which make upgrading your bow easier than ever. Definitely, when you purchase a recurve bow, you would want one that is easy to upgrade as you move on to different skill levels and activities since this will save you money. One of the upgrades you can have is increased eyesight. You can also install a takedown feature which allows you to change the limb which will enable you to increase or decrease the pullback weight. Another feature that this bow has to offer is the ability to order the bow in either right handed or left handed orientation. This is important because many of the bows only come with the option to use it right handed because most of the population is right-handed. Just for clarification, if you’re right-handed, you need to hold the bow with your left hand and draw with your right hand. If you’re left-handed, you need to hold the bow with your right hand and draw with your left hand. Make sure you choose the right orientation when you’re purchasing your bow. This bow requires assembly upon receipt, but the manufacturer has made sure that step-by-step instructions on how to assemble it have been provided. Nevertheless, assembling it will not be much of a hassle, especially if you have been working with recurve bows for quite some time. Also, since this bow can be disassembled, you can quickly pack it in your bag during your adventures as well as store it without taking up too much space. When you purchase the kit, you will receive the recurve bow and a set of accessories that have high quality and are tested to be great for shooting targets. This makes it easier than having to go and figure out every single accessory you need and purchase them individually. Once you receive the package, all the tools that you would need to upgrade and ensemble the archery equipment are included. You will also get 16 strands of Dacron bowstring with a stringing tool. If you’re not completely satisfied with the KESHES Takedown Recurve Bow, then we can highly recommend the SinoArt Takedown Recurve Bow. 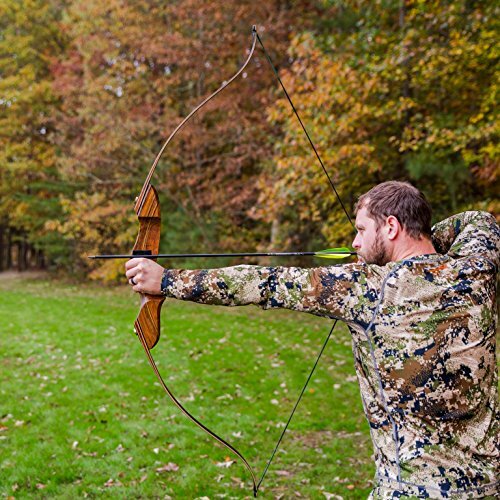 Not only is it great for hunting, but it is also designed to be used for archery competitions. This bow is made of high-quality hardwood and has a fiberglass limb. The bow length is approximately 68 inches and has a draw weight that ranges from 16 to 36 pounds. The riser height is 23.3 inches, and the max draw length is 32 inches. The weight of the whole recurve bow only clocks in at around 2.6 pounds, making it extremely easy to handle. The wooden design has a hint of Maplewood, making it perfect to put on display. Not only does it look great, but it is also built to be extremely durable. You can choose from both right- and left-hand orientations, and the handle is made so that you have superior grip. 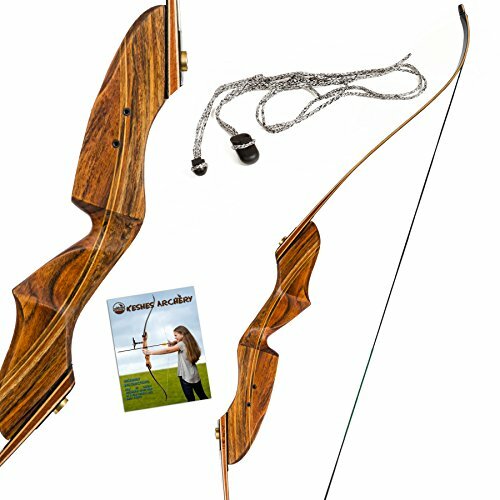 The kit comes with a riser, two bow limbs, one bowstring, one bow stringer, an arm guard, a finger tab, a recurve bow sight, and an arrow rest. As you can see, the Keshes 60-Inch Takedown Recurve Bow is perfect for individuals who are looking for a great hunting bow that is extremely comfortable and safe to use. It is also cost-efficient since it comes with all the extra accessories you would need as well as being designed in a way that you can easily upgrade it. If you are not satisfied, KESHES offers a 100% return policy on their bows because they believe that every customer must be happy with their purchase. Also, if the bowstring breaks, the company will provide you with a free Dacron replacement string.